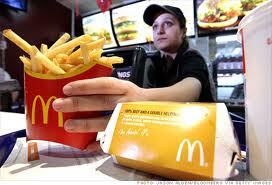 McDonalds believe that good customer service is the responsibility of everybody in the company. Every employee has a part to play in providing with a service with best practise found anywhere in the trade. McDonalds provide high quality products, such as burgers, fries, drinks, muffins, etc, which are safe and reliable that it does what it is supposed to do, but not only does the quality of the products matter, the good value for money affects the business. E.g. buy one extra value meal and get one free with a food voucher that represents the offer only. They ensure that a high standard of the product is carried out at all times and they try to compete very competitively with other fast food businesses with their good value for money. Also a customer would know if the product is good value for money by checking in another food outlet like KFC for their services and products. McDonalds also play a role especially into the goods being safe to use and being very reliable with provided instructions. This will benefit the customer’s safety and hoping to be very reliable during the customer’s use because its helps the business to increase it sales by keeping the existing customers and attracting new ones. The products of McDonalds are safely packaged when it is required for the product, in order the customer does not have any problems or and negative feedbacks to McDonalds. E.g. hot coffee cups have plastic lids on top so it does not spill or burn on the customer. Also, McDonalds ensure to offer nutritional guide of the product clearly state what the product contains. Also, the staffs are to wear the correct McDonald’s uniform, so they will be easily noticed by customers, if they need help by the staff wearing black trousers and top with a McDonalds logo on the t-shirt. All premises in McDonalds are cared for very much and are cleaned before opening times and after closing times. These are well sign posted with safety signs so to ensure the customer does not endanger him or her self in any way. Also these premises are quite spacious which customers can easily work through for their own needs. Some McDonalds have two floors but the one I visited on Broad St has one floor, but it is quite spread out which contains tables and chairs on the side of the walls, so the customer can easily walk through. High chairs, baby changing area and disabled toilet, normal separate toilets for men and women. McDonalds do not deliver their goods as it is not recommended as a customer service in the business, but if a customer were to have a disability, their goods would have been delivered by a member of staff on their own free will. This basically consists on the employee asking the customer if he or she is satisfied, both with the company’s goods and the service that it provides. Minor complaints are solved by staff on duty that apologise for the problem, provide the help or assistance required to check the customer is satisfied. E.g. the drink was flat, which the customer complained, so the staff had to give the customer another drink. If the problem is more serious, then it is referred to the manager immediately, so the problem is solved efficiently. Also if the product is quite cold, the matter will be resolved by a simple exchange for the same product without any hesitations. McDonalds do accept cash and cheques as a payment method but they do not take credit cards although there are ATM machines available outside most stores so the money can be obtained from the credit card easily. Customers intend to communicate with staff about a whole lot of issues relating to goods and services on offer, such as pricing, availability, contracts and after-sales service. Customers with different disabilities will have different needs. If in doubt, staff may find it hard to communicate during the customer’s order so the staff find will out from the customers individually of what method of communication suits them best. In addition to the telephone and text can benefit a range of customers. E.g. a customer is unable to talk and hear but is able to read, which the member of staff exchange written notes, in order to satisfy the customer by taking in his or her order. There are ranges of systems to enhance communication for people with hearing impairments. Some are relatively simple, such as induction loops, which is used at the counters. In situations where it is not reasonable to install an induction loop or other type of voice enhancement system, staffs communicates in other ways, such as exchanging written notes with customers with hearing impairments. The layout of a formal letter may include the manager’s address or name if known, the customer’s address and to terminate the letter with yours sincerely or yours faithfully. Also the grammar and punctuation is very important because sometimes it may mislead the person. Staffs are encouraged to look straight at customers and not cover the mouth when they are speaking to them. Allowing extra time, and repeating back to the customer to check accuracy and understanding, can benefit customers with learning difficulties and with speech impairments. Also McDonalds’s staff are in uniform, which may include blue top, jeans or trousers and a cap with a the company’s logo on each item so the customer can easily recognise of who to go for ordering and help during their presence in McDonalds. When the customer is in need of help staff would communicate to guide them through the food outlet but the customer may not be able to speak good English which the staff may intend to speak the language like urdu, so this is a form of verbal communication in another language.